LUCBAN, QUEZON - A suspected communist guerilla was killed while a rookie policeman was almost hit by a bullet in the head when a band of suspected New Poople’s Army (NPA) rebels and a team of patrolling policemen were figured in an early firefight at Bgy. Kalangay, here, yesterday. Quezon police director, Senior Supt. Osmundo de Guzman said the slain rebel armed with a rifle is yet to be identified by probers. De Guzman who personally led a reinforcement team on the area said elements of 1st Quezon Peovincial Mobile Force Company (QPMFC) under Supt. Arnulfo Selencio were conducting preventive combat operation when they encountered the fully- armed rebels numbering around 15 at 5:55 a.m.
At around 3:30 a.m., De Guzman said an information from a concerned citizen was received by Intelligence operatives of 1st QPMFC regarding the presence of an armed group at Bgy. Nalunao asking for food from the residents. 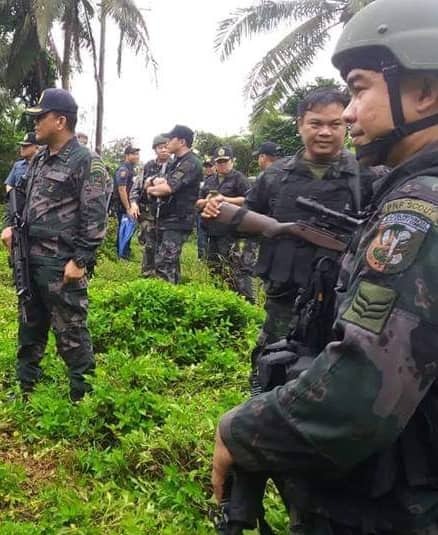 Upon learning of the information, De Guzman said Selencio immediately ordered the dispatch of police teams led by SPO4 Ramon Pagulayan to conduct preventive combat patrol. After almost two hours, De Guzman said the policemen were suddeny fired upon by the rebels hitting PO1 Erwin Lagundino on his kevlar helmet but he was unhurt. At that point, he said the policemen quickly opened fire killing one of the rebels on the spot. Minutes later, De Guzman said the rebels finally retreated toward different directions bringing with them a wounded comrade. Police recovered a cal. 30 Carbine rifle, a bandolier of ammunition, and sacks containing packed rice and canned goods.